There is nothing like a snowman bird feeder to put out in winter season and brighten up your back yard. This birds feeder is made of sturdy metal and will last in all weather conditions. It comes with a sturdy chain that is easy to hang. The metal mesh is squirrel proof, and they cannot chew trough it and damage it. The No/No Mr. and Mrs. Snowman Bird Feeders is best for black sunflower oil and safflower seed, it will attracts birds like goldfinches, red cardinals, chickadees, tufted titmice and more. These birds will come and cling on the side of the feeders and feed. The smaller seeds are not so good as the holes are too big for them. Sunflower seed is one of the best choices for mesh feeders. It will attract all kind of birds like finches, sparrows, cardinals, juncos, grosbeaks and more. Sunflower seed are full of potassium, magnesium, iron and some vitamins that will help birds, more in winter season. The seed is a rich source of oil that keeps birds warm in cold weather. Peanuts are one more great winter food and a rich source of oil, vitamins and birds love it. In winter birds need extra energy to combat extreme cold weather and peanuts are perfect for that. This bird feeders comes with a solar powered light that is incorporated in the hat part of the feeder. When you install the feeder leave it for a day to charge the battery before you turn it on, it may not light up if it is not charged. Leave the switch off while charging the battery. I recommend that if your solar panel is not working when you switch it ON leave it OFF for two days so it can charge before turning it ON again. Some users reported it helps to do this if the light is not glowing. If the light is still not working after that then contact the customer service to replace it. The solar light will glow for most of the evening and maybe till morning if the feeder was fully charged in a nice sunny day. If you want to get the most from the light display, you can leave the top head part of the feeder empty. This way the head will light up when the light switch is turned on in the evening, it will look great that way. When you clean the feeder, remove the part with the battery, and just wash the rest of the metal body in warm water. It is easy to clean, and refilling is fast. You can even use a small brush to clean dirt that may get stuck on the metal mesh. The metal body will not get damaged while cleaning. Mesh holes are a little bigger than I expected, so the mixed seed will not work, but black oil sunflower seeds work great and is best to use. It is best to place the snowman bird feeder out of reach of squirrels. It is made of metal so it is squirrel proof, but they can still jump and swing the feeder and spill seed, you don’t want to waste seed. The feeder comes with a good chain that can be hanged easily. This bird feeder come as Mr. and Mrs. Snowmen duo, or you can just buy them separately if you want, in that case you get just one half price. I think it looks nice to hang them in pairs, but the choice is yours. The feeder is made of metal so it will be squirrel resistant and there is not easy way for them to damage the light inside. The only way this will happen is if the feeder is knocked down on the ground, so make sure it is hanged safe and secured from falling. If you have cats, make sure you hang it in a place where birds can see the cat from all directions. This way cats cannot sneak up to the birds and surprise them. You will save some bird lives and have lots of fun watching them feed in your backyard. This feeder is a lovely gift. 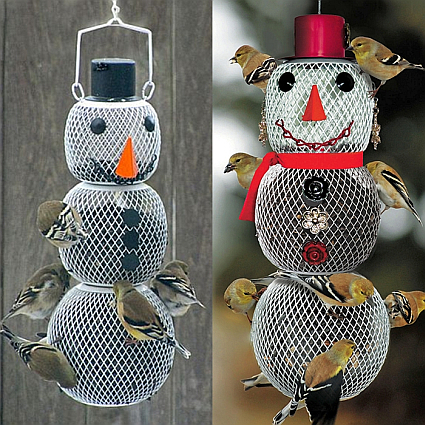 The snowmen bird feeders is well build, its metal mesh will protect it from squirrels, and it is great for all weather conditions. It is best used for sunflower and safflower seeds, and will attract large variety of birds, as most birds eat sunflower seed. It is easy to clean and maintain. Even if you don’t want to use its solar light feature it will do great in its primary function as bird feeder. Check the price of No/No Mr. and Mrs. Snowman Bird Feeders here!